What is a Manufactured (mobile) home? Manufactured homes, also known as mobile homes, are built entirely in a factory under a federal building code administered by the U.S. Department of Housing and Urban Development (HUD). The Federal Manufactured Home Construction and Safety Standards (commonly known as the HUD Code) went into effect June 15, 1976. Manufactured homes may be single- or multi-section and are transported to a site and installed. The federal standards regulate manufactured housing design and construction, strength and durability, transportability, fire resistance, energy efficiency and quality. The HUD Code also sets performance standards for the heating, plumbing, air conditioning, thermal systems and electrical systems. HUD code is the only federally regulated national building code. On-site additions, such as garages, decks and porches, often add to the attractiveness of manufactured homes but must be built to local, state or regional building codes. Each manufactured home must be designed according to the federal Manufactured Home Construction and Safety Standards at 24 CFR 3280, commonly called the HUD Code. The HUD Code stipulates, at §3280.305(c)(3), that the home shall be designed and constructed to conform to one of three roof load zones. The appropriate roof load used in design is dependent on where the home will be initially installed. Homes designed and constructed to a higher Roof Load Zone can be installed in a lower Roof Load Zone (a home designed to a North Zone can be installed in a Middle or South Roof Load Zone). However, a South Roof Load Zone home cannot be installed in either a Middle or North Roof Load Zone. Roof load (live load) design is affected by the shape of the roof whether it is flat, curved or pitched. Roof loads are a downward (vertical) force on the home. 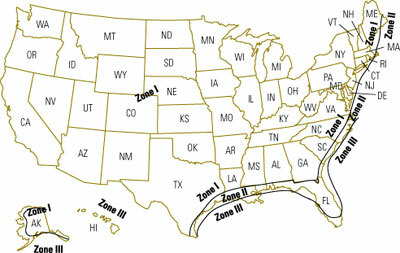 The North Zone, Middle Zone and the South Zone are identified on the roof load zone map above. This downward imposed load on the home is also known as the snow load. The North Zone design live load equates to 40 pounds per square foot, the Middle Zone equates to 30 pounds per square foot, and the South Zone equates to 20 pounds per square foot. Each manufactured home must be designed according to the federal Manufactured Home Construction and Safety Standards at 24 CFR 3280, commonly called the HUD Code. The HUD Code stipulates, at §3280.506, that the home shall be designed and constructed to conform to one of three thermal load zones. The appropriate thermal zone value used in design is dependent on where the home will be initially installed. Homes designed and constructed to a higher Thermal Zone can be installed in a lower Thermal Zone (a home designed to a Thermal Zone 3 can be installed in a Thermal Zone 1 or 2). However, a Thermal Zone 1 home cannot be installed in either a Thermal Zone 2 or 3 area. The Uo value zone is determined from thermal zone map above. The Uo value is the overall coefficient of heat transmission of the manufactured home based on the respective thermal zone location and an indoor design temperature of 70 oF, and is defined in units of BTU/(hour)(square foot)(oF). 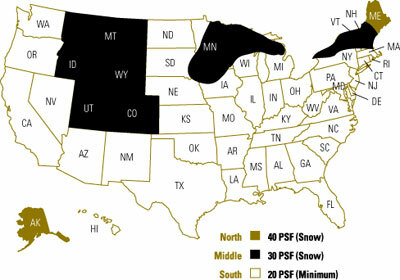 The overall Uo value for the home thermal envelope design must not exceed the values as shown on the above map. The design Uo value for Thermal Zone 1 is 0.116 BTU/hr·ft2·oF, for Thermal Zone 2 is 0.096 BTU/hr·ft2·oF, and for Thermal Zone 3 is 0.079 BTU/hr·ft2·oF.